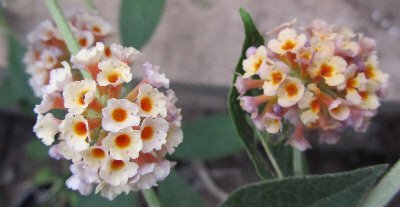 The name B.x weyeriana is used for hybrids of B. davidii and B. globosa. During the WW1 Major William van de Weyer of Smedmore House, at Corfe Castle, pollinated the South American species B.globosa with pollen from B.davidii var.magnifica, a native of China (Weyer 1920). This was a fortunate occurrence as it is rare that these two species should be in flower at the same time and even more fortuitous that Major van de Weyer should be on leave at the time. The resulting F1 (first generation) progeny were a disappointment: poor colours, mostly greyish white with a violet flush. He then interbred the F1 plants taking seeds from a single F1 plant. 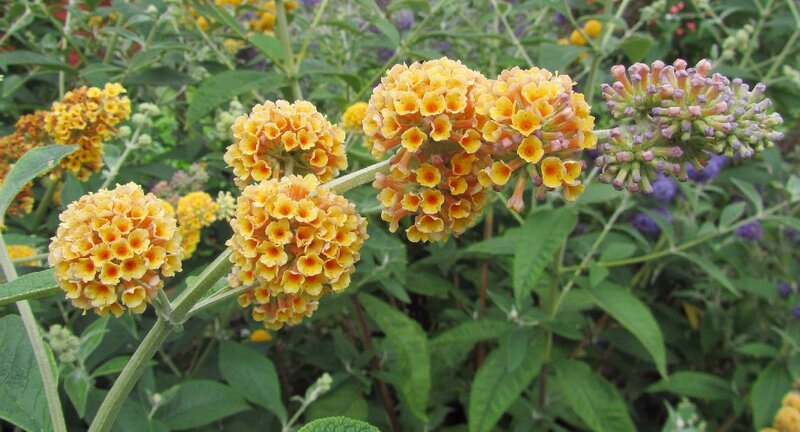 He met with more success in the F2 plants giving the world the yellow flowered Golden Glow. It has always been assumed that the cream-coloured Moonlight also occurred at this time but van de Weyer doesn’t mention it although he does describe a series of plants from this generation. You can read van de Weyer’s 1920 article here. Both these hybrids have lilac buds and a slight flush to the open flowers but are still popular today. The flowers are somewhere between the golf-ball of B.globosa and the panicles of B. davidii. 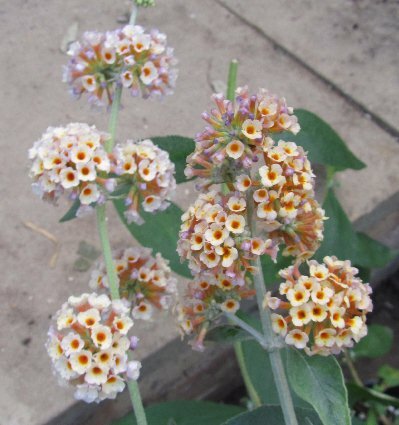 Flowering starts a week or two after B.davidii and can continue until the first frosts as they both tend to have a low seed set, although by no means completely sterile. They are generally believed to be pollen sterile but this is possibly not the case. Since the original cross was made the search has been on for a better yellow cultivar. Sungold is a sport (not a seedling) of Golden Glow raised in the 1960s from Holland, which has no lilac flush and is a good clear yellow (de Vogel 1967). These three cultivars are the recognised B.x weyeriana hybrids. But things are actually more complicated. Numerous other lilac-flushed yellow B.x weyerianas are listed – Elstead Hybrid, Lady de Ramsey, Golden Tassles and Trewithen. Beech Park, a cultivar listed in Ireland, and Liberty from Stone Green Nurseries, Kent both appear to be Moonlight (pale). 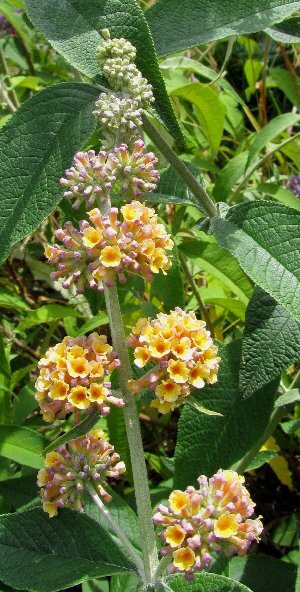 Whether these ever existed as separate cultivars or were just mis- or re-named plants of the three above named Buddlejas is open to question. All these B.x weyeriana hybrids share green foliage that is intermediate between the two parent species. A variegated yellow B.x weyeriana was also listed by the RHS (as Flight's Fancy). At the Longstock Park National Collection there is a variegated B.x weyeriana with a random variegation pattern (not at the leaf margins and unlike the B. davidii variegated cultivars). 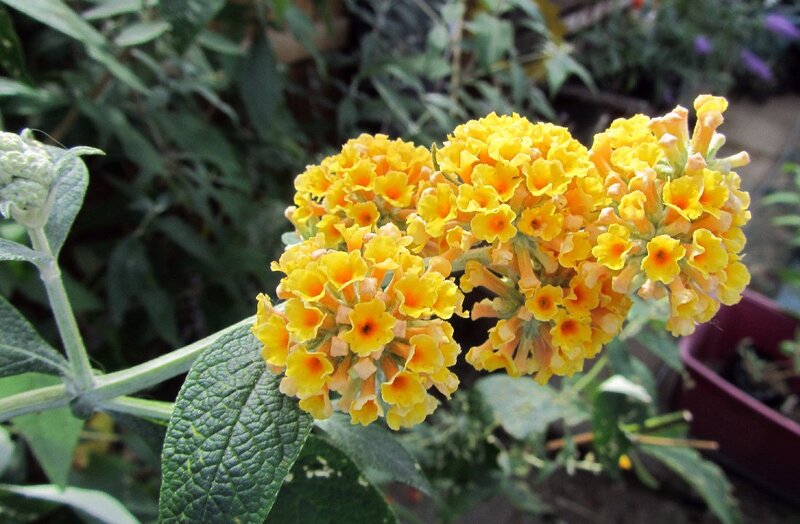 It appears to be a sport of Sungold and has clear yellow flowers without a lilac flush. You can just see the slight colour in the buds on the left in the cultivar Sungold, Honeycomb has the pure yellow buds. Honeycomb is another pure yellow cultivar very much like Sungold and may actually be distinct. 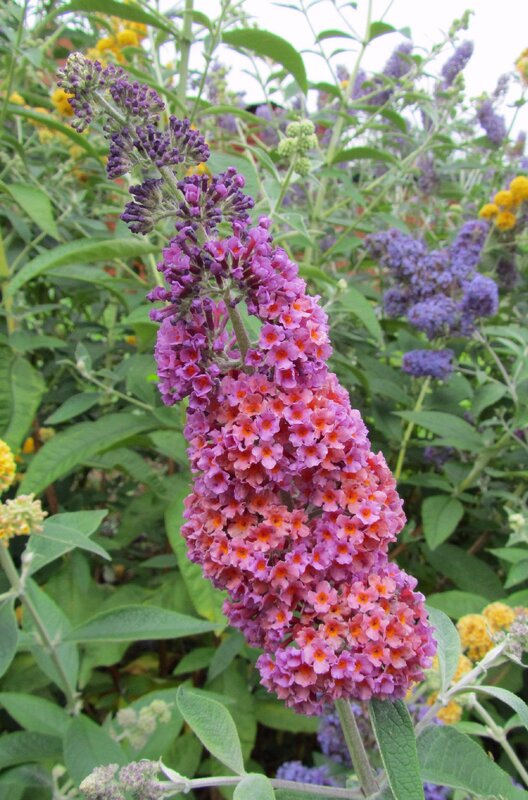 Apparently, it was bought from Crathes Castle in Scotland and taken to the USA by the well-known Buddleja expert Mike Dirr (University of Georgia). How it came about has been lost to time. Subsequently, he used it to breed a number of novel hybrids. I have two plants labelled Sungold from different sources. The difference is subtle to the point of non-existent. The buds of one are greyish, whilst the other has pure lemon-yellow buds (see left). This latter plant also sets much more seed (which is fertile) than the other, which sets relatively little seed (which is also fertile). I have been tempted to label this more fertile plant as Honeycomb as it meets all the criteria for the cultivar description, the less fertile one being left as Sungold. Somewhat arbitrary, I know, but it seems the best solution. In this photo of Golden Glow you can see the lilac buds and the flush that remains in the flowers. An alternative explanation is that Honeycomb is the real Sungold and that the plant I calling Sungold here is another forgotten hybrid. The colour of the buds shown left is inconsistent and extremely transitory lasting less than a day. This is very unlike Golden Glow (see right) or any of the other lilac-flushed hybrids described, which retains the lilac through to the flower. Moonlight also seems to come in two flavours. In the Lavender Garden National Collection (Gloucestershire) there are two distinct Moonlights. 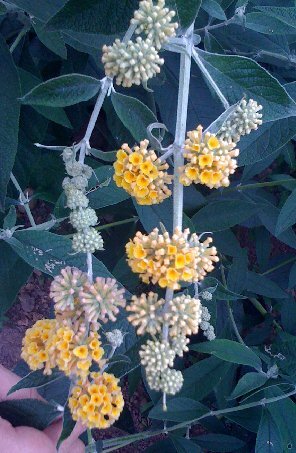 One has pale soft flowers and this is probably the original Weyer plant (see below). The other one is a creamy biscuit colour (let’s call it Moonlight Biscuit) and it possibly originates in this collection. Moonlight Biscuit could well be a 'sport' of Golden Glow rather than a genetically distinct seedling. The flower morphology of Moonlight Biscuit resembles Golden Glow more and in a recent dry summer my Golden Glow did produce a single flower head much like Moonlight Biscuit. I think it unlikely that Moonlight Biscuit is a sport of Moonlight Pale. Moonlight Pale (left) has larger petals that contribute to the softer look. Moonlight Biscuit (right) has a flower type more like Golden Glow. Moonlight Pale (left) is just a little paler than Moonlight Biscuit (right); the pale variety also seems to have softer flowers. More B. x weyeriana hybrids have recently been bred. These are a more complex mixture of B.davidii and B.globosa, from the cross B.x weyeriana X B.davidii. 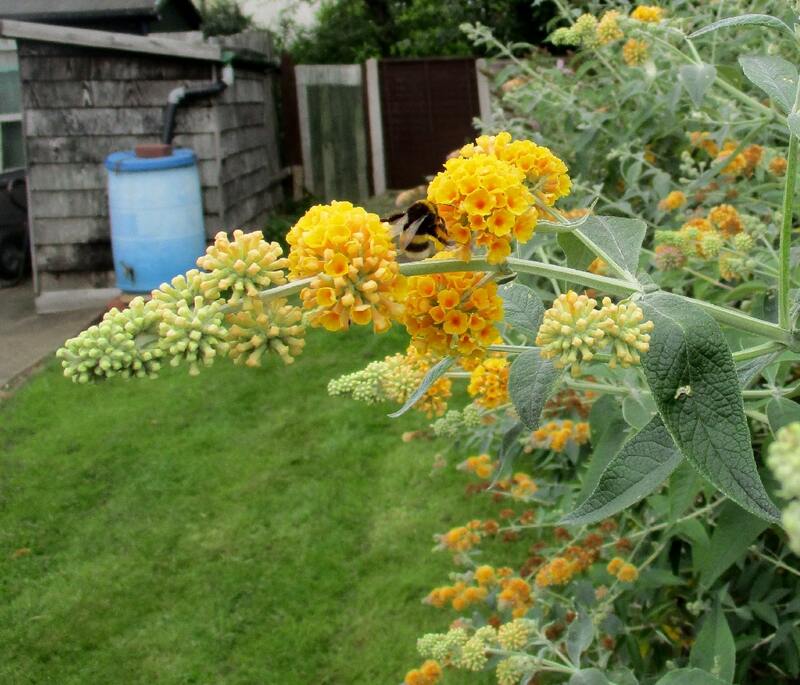 Bicolor, also called Flower Power in the UK, was derived from Honeycomb open pollinated by B.davidii. Pink Pagoda and Blue Boy also seem to be rather more like B.davidii than the traditional weyeriana hybrids in that the flowers are in panicles and not at all globose. I am not aware of any of the three setting seed. Attraction is an American culitivar from Mike Dirr at the University of Georgia that is believed to be a Honeycomb X Royal Red cross, which in turn has been used to breed the deep-pink hybrids Miss Ruby and Miss Molly. Buddleia Flutterby Grande™ Vanilla (Podaras#1) Buddleja weyeriana `Honeycomb` crossed with an un-named Buddleja davidii. 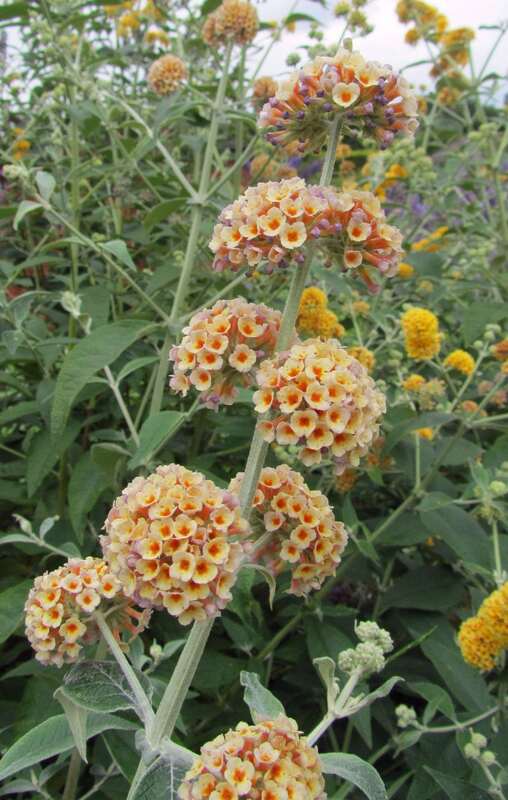 Buddleja weyeriana cultivars can produce fertile seed. As mentioned above, Honeycomb is particularly fertile. The seeds capsules are about 4-5mm long and resemble smaller versions of B. globosa capsules. They take longer to mature compared to B. davidii. The image (left) shows a typical fertilsed seed-head, but it is usual for B. weyeriana plants to have many more unfertilsed flowers that do not go on to produce these seed capsules. These are from Moonlight Biscuit and I have been able get a high germination frequency with them. 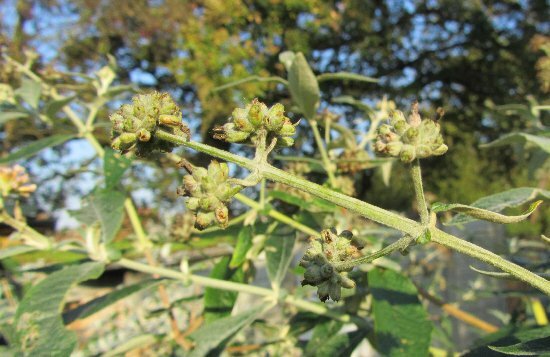 All Buddlejas have tiny, tiny seeds. Those of B. davidii, extreme left, have double wings. B. globosa seeds (centre) are wingless, which one reason why this species is less invasive as its seeds are less mobile. When I cleaned up seed from Honeycomb I found that the seeds (right) are rather irregular and hard to discern from the very abundant chaff. Some look a bit like miniscule sycamore seeds or like commas with single wings, although it is possible that the wings are double but so fragile that some are lost when shed from the seed capsule. 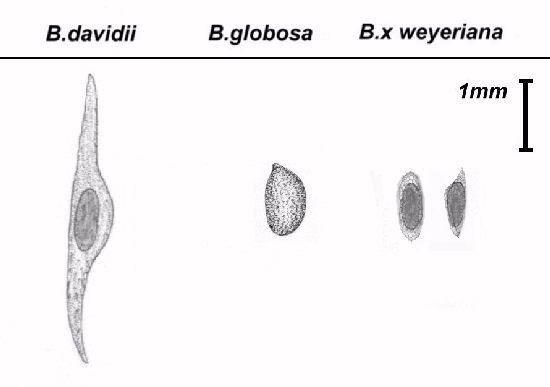 The seeds (excluding the wings) are much smaller than those of B. globosa and slightly smaller than those of B. davidii, and unlike both ancestors. I am growing a number of seedlings from these Honeycomb seeds, presumably pollinated by B.davidii, trying to create new and unique cultivars. The germination frequency was surprisingly high. There is a huge variation in foliage type but few have flowered yet. One that has flowered in the first year looks to be very promising. 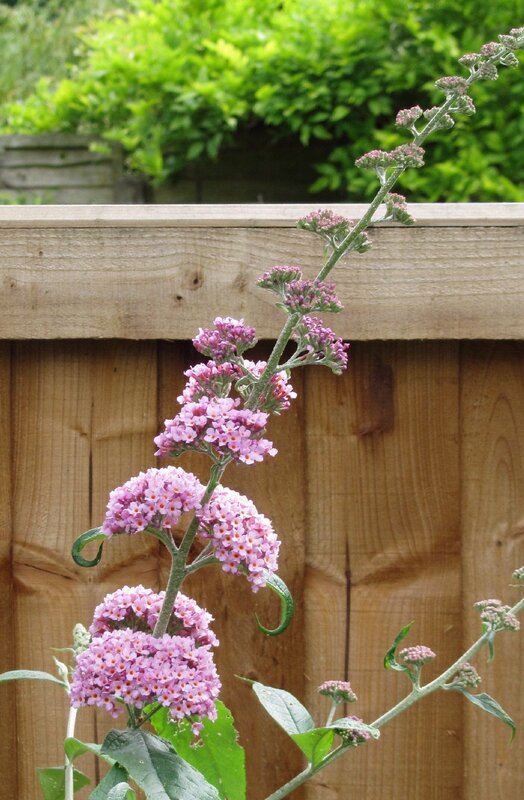 The buds are strongly lavender coloured but the flowers are creamy with a blue, rather than pink, flush. Several other seedlings have flowered in shades of mauve and purple. The one below is a more typical flower colour of the Honeycomb seedlings I have grown. The large red/orange eye is a particularly attractive feature. One of the original hybrids of de Weyer, yellow flowers from lilac buds; the flowers often retain a faint lilac blush. It seems a bit less vigorous than the other cultivars. Not easy to tell from Sungold and may not even be a separate cultivar. The image shows Honeycomb and Sungold planted side by side - Honeycomb may be a bit more vigorous. The other original hybrid of de Weyer. 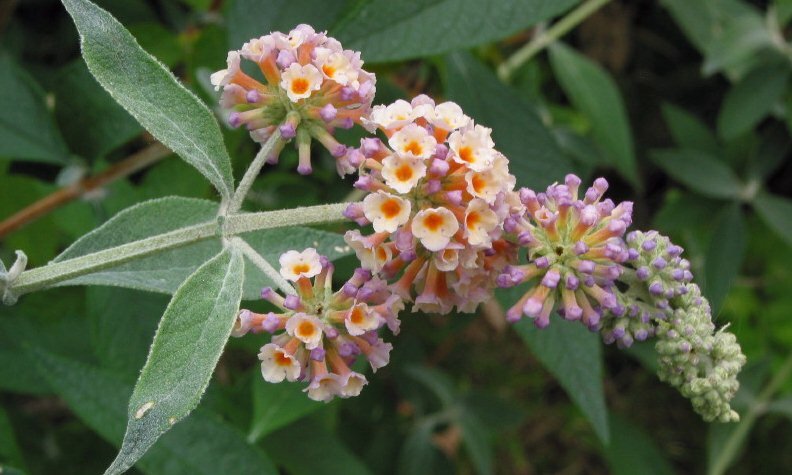 Creamy lilac-flushed flowers paler than Moonlight Biscuit (below) but otherwise similar (photo courtesy of the Lavender Garden). See above for a direct comparison. This is Moonlight Biscuit, with a nice lilac flush to the biscuity flowers as they open. A better bet than Golden Glow as the flowers have a much clearer yellow colour. Virtually indistinguishable from Honeycomb. A sport of Sungold with the same clear yellow flowers. 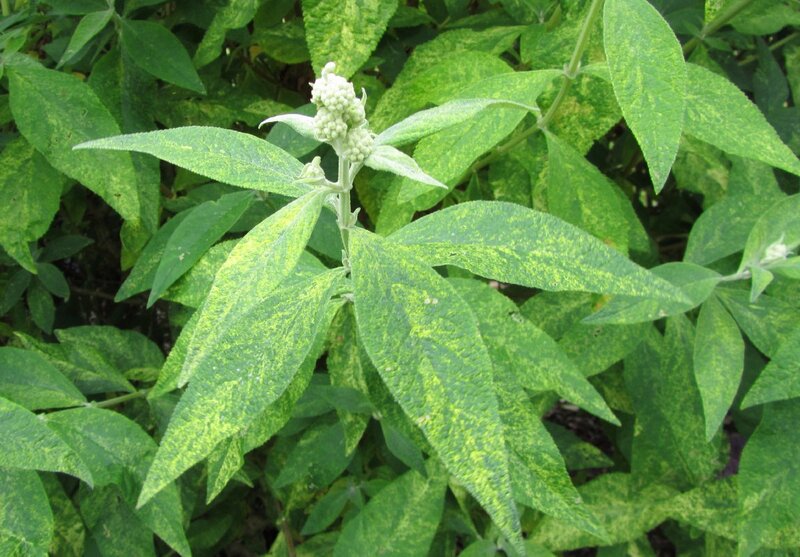 The variegation is splotched rather than at the leaf margins, some say it looks like spider-mite damage. Might be the mysterious Flight's Fancy listed by the RHS. Photo taken at Longstock August 2012. Sometimes called Flower Power or even mis-identified as Bonnie, Bicolor is a seedling of Honeycomb from Mike Dirr and resembles B.davidii more than the weyeriana hybrids above. Purple-pink flowers that fade to a butterscotch orange. It is quite effective. Bred by Peter Moore at Longstock Nursery. Originally rejected but back in cultivation now. I was lucky enough to get a plant a while back. 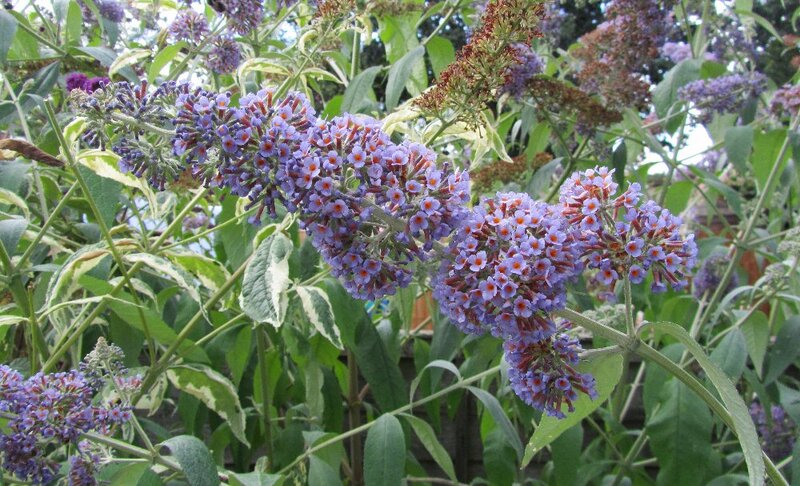 I like it - big, big leaves in spring and really interesting pale blue flowers with a bright orange eye. Very vigorous but worth a go. Another excellent hybrid from Peter Moore - the panicle is in levels just like a pagoda. Really good shell-pink flowers, less shocking than Pink Delight.